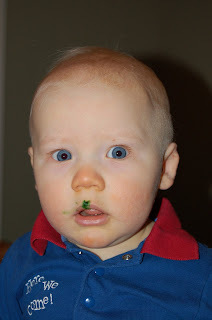 Thank you God for washable, non-toxic markers...caught him just in time. This could have gotten ugly! Notice he's giving me the stink eye...how dare I take away his green marker just when he was getting started. In case you're wondering...I am a loser. Well, not totally a loser - because I think I've got some pretty good qualities. But loser in the sense that I am not going to do what I said I was going to do. Remember back when I was so sure that I was going to run that 5K in LR? Well, I'm not. 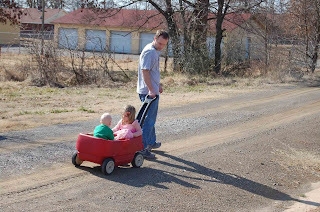 Once I got sick and my kids got sick, I never stepped on the treadmill again. And, once you quit getting up at 5, it's pretty darn hard to start doing it again. Even if it's just 30 minutes more sleep. 30 extra minutes is awesome! So, I gave up. I don't like it. But, I did it. Last week, I got back on the treadmill and have been very consistent. No more pressure, no more guilt. Just doing what I can - which I think is what I need right now. And...no more house cleaner. After getting rates I decided I would just do it myself. I'm just too cheap. Maybe one of these days it will be important enough to me to pay what I've got to pay to get someone to do it. Until then, I'll either have a messy house, or be tired from cleaning it myself. I just want someone to clean the floors/bathrooms/dust etc. Ideally on Friday - so I can enjoy the clean house on the weekend - and not feel like I have to spend the whole weekend cleaning. I would LOVE to be able to play with the kids and not spend the entire weekend cleaning...wouldn't that be nice. So, if you know me - and know where I live - and know of someone who would be willing to drive to where I live, I would love to have some names. I like the kind of clean where you walk in the house and it smells clean...ahhh. 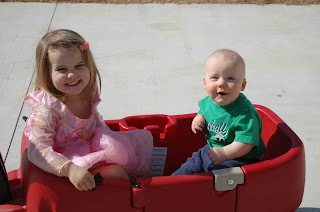 Don't you just love wagons, princess dresses, warm days, daddys and little bald babies? I do. OK, so I'm pretty sure no one cares about this but me...but this blog is also doubling as Eli's "baby book" because I'm terrible at writing in his real book...and I'll never remember this stuff! He went from laying down to sitting up all by himself last night! Once he figured out he could do it there was no more laying down! It doesn't seem possible that he could be almost 9 months old...I want to freeze this and make it last a little longer!